Brand New! 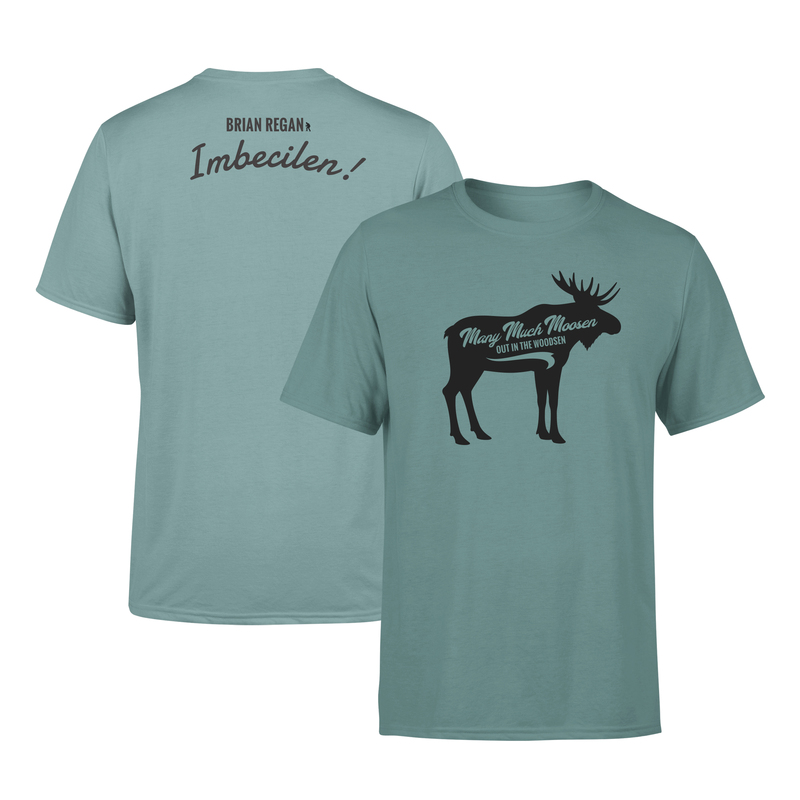 Super soft t-shirt features Moose image on front and Brian's logo on the back. Just saw Brian at The Fox Theater in Tucson last night. I have not laughed soooo hard in a very long time. Thanks Brian for the flood of endorphins. My brother loved this gift! This is not the first order from Brian Regan. I also ordered the "it's not the heat it's the humidity" shirt and it came in a timely fashion and we were very happy with the quality of the garment. Just recently I got my second order the "much moosen" T-shirt into blacky black coffee mugs these were also for my son Steven and very happy with the way they were shipped the mugs were and protective so they wouldn't break and the shirt was excellent fit good great material very happy with the quality of the merchandise bought on the site . And if you're a Brian Regan fan you're going to love the stuff. Can't wait for some more choices and t-shirts and I love his current Netflix show. I'm hoping in the future those episodes may be available for purchase as well . The shirt came exactly when it was promised and it is excellent quality and my husband LOVES it. It's a nice heave weight t-shirt that doesn't lose it's shape after washing. I actually want to get one for myself. Love the color and that there is something funny on both sides...front and back. Bought the new moosen t-shirt for my husband for Christmas. It arrived late Christmas Eve and I was able to sneak it under the tree Christmas morning. He LOVED it! Fits perfectly but will be sure not to dry it. Would Love it if you used pre-shrunk fabrics for idiots like me (not) and my husband (no comment) when it comes to laundry and such. Purchased 5 many much moosen T-shirts (one in each size from Small to XXL) for our entire family to wear. Soft as advertised and came true to size. Love the color. Family loves the shirts. Perfect gift for my brother, the ultimate Brian Regan fan! Nice, soft shirt and has some of very favorite quotes! Comfort Colors is my favorite brand of tee shirts and I didn’t realize I’d be getting one with this purchase. It’s super soft. Good quality print. Excellent quality overall. Very happy with my purchase. The t-shirt was a gift for my nephew. He loved it! High quality shirt. My entire family has seen Brian in concert, we obviously love him! When I saw this shirt I had to get it for my nephew's birthday, as this is one of his favorite sketches. We also travel a lot and will never be able to board a plane again without hearing Brian's take on flying. Thank you!!! My kids and i have been fans of Brian Regan for years. I bought the many much moosen shirt for my son for Christmas, he LOVED it!! Great quality, perfect fit. My daughter was jealous! I think you should make a shirt that says, the big yellow one is the sun, with the solar system on a coat hanger. Or a shirt that says cup of dirt, with a cup of dirt on it. Great shirt. Good quality; including the printing. Shipped in a timely manner. Highly recommend.